When I discovered that a new dedicated gluten-free restaurant popped up in the Washington D.C. restaurant scene, it was enough for me to make last minute Labor Day weekend plans to check out the latest addition to the growing number of totally gluten-free foodie destinations in the Nation's Capitol. 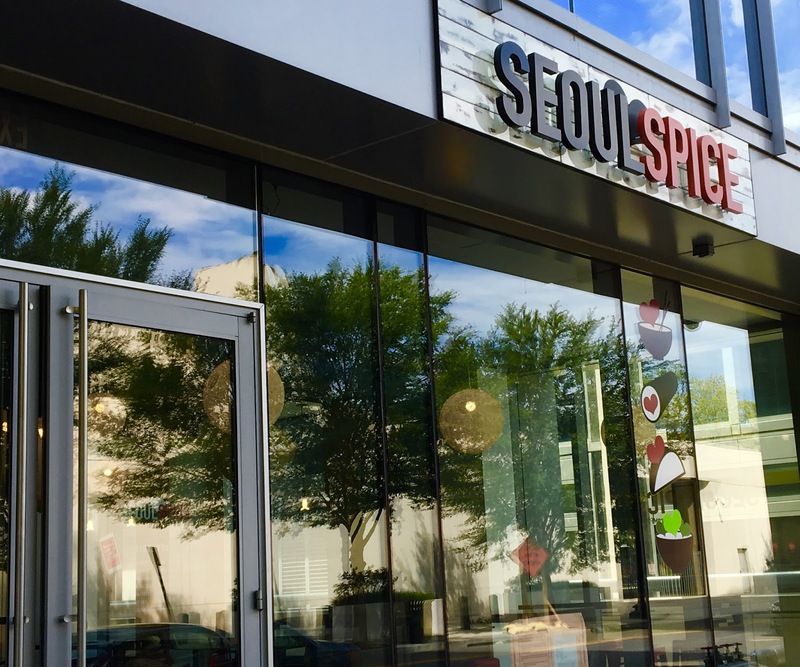 Seoul Spice, located mere steps from the NOMA/Gallaudet stop on the Metro red line is the restaurant in question, and goes beyond a gluten-free menu to offering completely dairy-free options as well. I have to admit that despite my frequent forays to Asian restaurants, I have never tried a dedicated Korean restaurant in all my gluten-free travels. I had no idea what to expect, but definitely felt more comfortable approaching the unfamiliar cuisine knowing that I could safely try anything on the menu. Seoul Spice falls in the emerging category of restaurants I like to think of as "Chipotle" spin offs that happen to be far more innovative and intuitive than the ubiquitous chain. 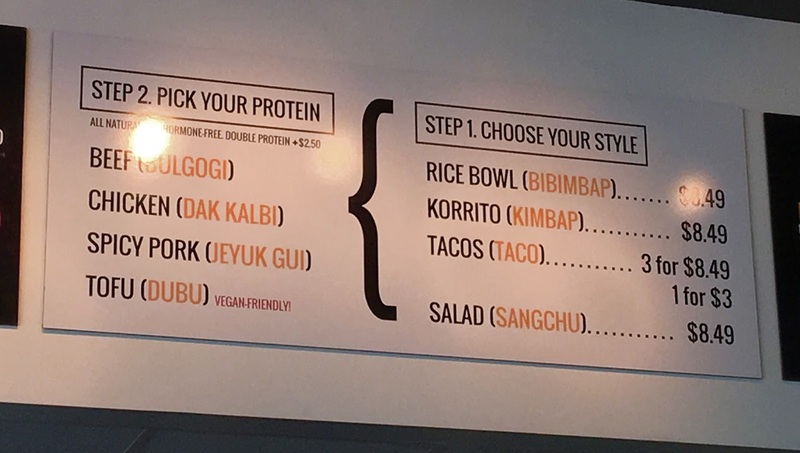 Orders are custom made down an assembly line of colorful options, and diners can choose between a rice bowl (bibimbap), korrito (kimbap), tacos, or salad (sangchu) as the delivery method of chosen meat(s), vegetables, sauces, and toppings. Pre-selected options are provided, but ultimately the design of your meal is up to you. Already gluten and dairy-free friendly, the menu also notes vegan options. I ended up going for the korrito, basically a burrito-style wrap using seaweed and sushi rice. 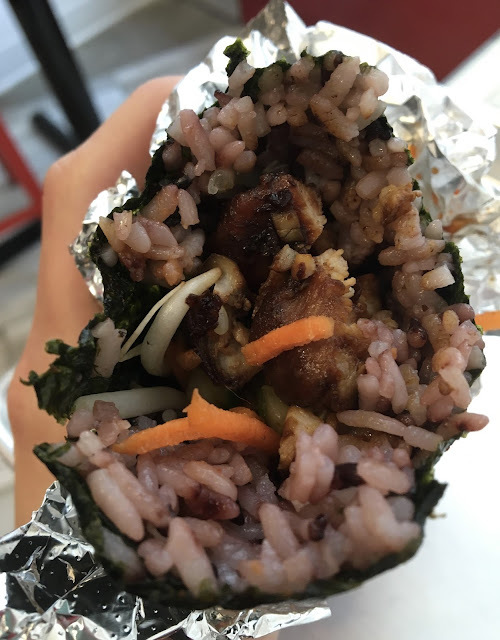 I chose purple rice for my wrap (the other option being white rice), and selected chicken, carrots, cucumbers, bean sprouts, kale slaw and kimchi as my fillings. Because everything is wrapped together, it's hard to differentiate the flavors of all the ingredients. The chicken stood out as decidedly sweet and savory, and I loved the tartness of the kimchi. The veggies were notably fresh, and I really liked the experience of eating a wrap, as that's rare in the gluten-free world. My one and only complaint was that the wrap itself was really unstable and quickly disintegrated, which meant that chunks of rice, veggies, and chicken kept escaping the wrap. It was super messy to eat, and I definitely will order a bowl next time to better manage (and keep) all the food. Although I was a little intimidated by my unfamiliarity with Korean food, I was won over easily by Seoul Spice, and plan on being a repeat customer in the future. The food is not only delicious, but easily customizable and comes with a built-in peace of mind from knowing that it is totally safe and free from cross contamination. Seoul Spice earned two thumbs up, way up, from me, and earn bonus points for easy Metro access and a prime location that's removed from more tourist-y parts of the District.